Distributing Water Burns Electricity, a Fact California is Only Starting to Reckon With. Most of us hardly think about it, but when we turn on the tap, we’re not just using water — we’re also using energy. And you may be surprised to learn just how much. Statewide, water consumes nearly a fifth of our electricity and a third of our natural gas, according to a 2005 California Energy Commission (CEC) estimate. Although it’s been a decade since the commission brought this hidden energy drain to light, we have made little progress in conserving the energy embedded in our water. This goes for both the agencies that manage water and the people who use it. “Energy use by water agencies is almost invisible,” said Ned Spang, associate director of the UC Davis Center for Water–Energy Efficiency. He thinks many water agencies, like many households, just automatically pay their energy bills without really thinking about how much power they use. California water agencies are not required to use less energy, nor are they required to report or even monitor how much they use. While some agencies do track energy use, many do not and this lack of data hinders cutting back. “You really need to dig into the numbers to conserve energy,” he said. Spang hopes more water agencies can be convinced to track how much energy they use. California public utilities have a pot of money for energy efficiency programs, and these could be extended to include water. In addition, case studies document the financial benefits of saving energy, which is a major cost for water agencies. It takes a lot of power to get water to our taps — conveyance from the source, treatment, and distribution — not to mention cleaning the wastewater we send down drains. The particulars of water-related energy use vary widely depending on the water source and quality. At one extreme is San Francisco’s main source of water, the Hetch Hetchy reservoir in Yosemite National Park. A water provider’s dream, Hetch Hetchy collects water so pure that it doesn’t need treatment and at such a height that gravity is enough to move it all the way from the Sierra Nevada to the city. No wonder San Francisco doesn’t want to give it up. The Contra Costa Water District has to work much harder for its water even though it comes from a local source, the Sacramento-San Joaquin Delta. Pumping water up from the Delta, which is at sea level, takes about one watt-hour per gallon, and making this brackish water drinkable and pumping it to users takes another two watt-hours per gallon, according to spokesperson Jennifer Allen. This may not sound like a lot, but it adds up fast. The district supplies about 36 billion gallons of water per year, bringing the annual energy for conveying, treating, and delivering water to about 108 billion watt-hours — enough to power roughly 10,000 homes for a year, according to the U.S. Energy Information Administration. Getting wastewater to most Bay Area treatment plants doesn’t take energy. These facilities are typically right on the edge of the San Francisco Bay, and our wastewater drains downhill to them on its own through enormous pipes. “They’re big enough to stand up in,” said East Bay Municipal Utility District spokesperson Abby Figueroa. 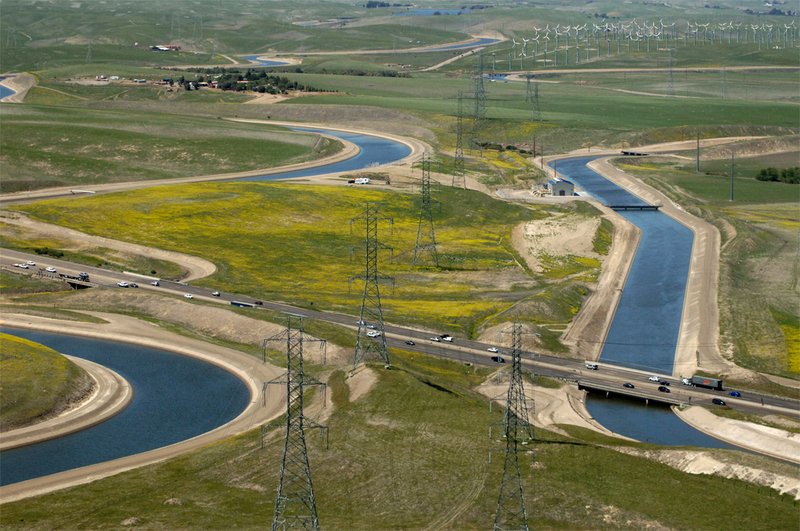 The California Aqueduct and Delta-Mendota Canal travel near each other in California’s San Joaquin Valley, They divert water from the Sacramento-San Joaquin Delta to cities and farms throughout Southern California — and consume large amounts of electricity in the process. However, it does take energy to make our wastewater clean enough to discharge into the Bay. The East Bay district uses about 4.5 million watts to treat some 22 billion gallons of wastewater per year, Figueroa said. But it also uses the sewage sludge in that wastewater to create energy. At the base of the Bay Bridge in Oakland, the district feeds a mix of sludge, commercial food scraps, and other organic waste into an array of 12 gigantic anaerobic digesters that produce methane, also called biogas. The district then burns this gas to spin turbines that generate electricity. In 2012, its wastewater treatment plant became the first nationwide to produce more energy than it consumes, most recently 6 million watts per year. The agency cut energy use 15 percent by promoting water conservation and another 18 percent by installing more efficient pumps. There’s only so much water agencies can do to conserve energy. Customers consume three-quarters of the electricity and nearly all of the natural gas use embedded in water, according to the state energy commission. We use energy to heat water for showers, washing machines, and dishwashers, as well as for commercial and industrial processes, and to pump agricultural irrigation water. What can we end-users do to save energy? The best way is conservation. “Any time you conserve a drop of water, you are conserving energy on top of that,” said Newsha Ajami, the director of urban water policy at Stanford’s Water in the West program. Using less cold water conserves embedded energy, and using less hot water conserves both embedded and end-user energy. About 15 percent of home energy use goes to heating water, according to the U.S. Environmental Protection Agency. Energy-efficient appliances can help too. The high-efficiency washing machines that use less energy also use less water, which automatically saves embedded energy. Smaller volumes of water also take less energy to heat, and heating water accounts for about 90 percent of the energy used by washing machines, according to the EPA. But energy-efficient appliances can also backfire. Tankless water heaters save energy on-site but waste plenty of running water — and the energy embedded in it — while we wait for it to get hot. The state energy commission called for communication between these silos 10 years ago. And better coordination is in the works, UC Davis’s Spang said. The California Public Utilities Commission has been developing a water-energy calculator since 2007 to evaluate the costs and benefits of water-energy efficiency programs. “It may feel slow,” Spang said. “But California is ahead of a lot of the country in identifying this as an issue.” The payoff would be huge: the energy commission estimated that conserving water alone could save nearly as much energy as dedicated energy efficiency programs, and at just 58 percent of the cost. Robin Meadows is the reporting fellow for the 2014-15 Water Education Initiative, a program of the League of Women Voters of the Bay Area Education Fund. This article originally appeared in the Bay Area Monitor, a league publication.